The 1965 Topps Joe Namath rookie card is quite possibly the face of the entire football card hobby. And the perfect image of a young Namath clutching the ball, ready to break down an opposing defense. Add to that Namath's incredible popularity as one of the game's biggest legends and it's easy to see why collectors go crazy for this card. Demand and prices remain incredibly strong, placing the card high on the list of the hobby's most valuable football cards. In this guide we'll go over everything you need to know if you're considering to add a Namath rookie card to your collection. They're not technically two separate rookie cards. They were just printed in two different variations. The first and most common is the one free of print marks. The second and more scarce, known as the "Butterfly" variation displays an obvious print mark on Namath's left hand. Distinction: This is Namath's only recognized rookie card in the hobby and the key to the 1965 Topps set. 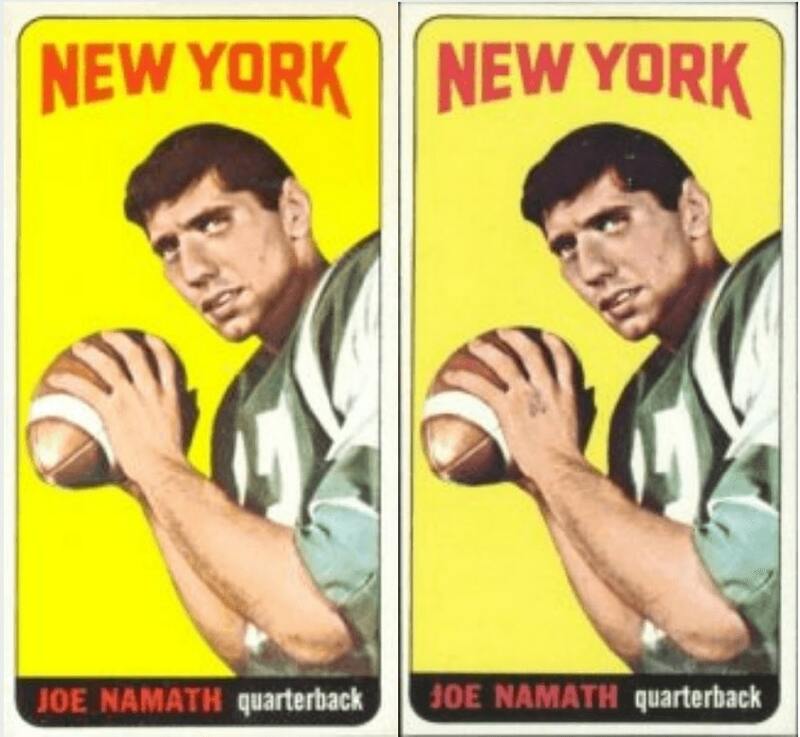 As mentioned previously, you can see that there are two variations: the base version and then the "Butterfly" variation that shows a print mark on Namath's left hand. There is no real difference in value between the two. Number: This is card #122 in the set of 176 cards. Measurement: 2 ½" by 4 11/16"
Design: The 1965 Topps football cards were tall in design, so much so that they are commonly referred to as "Tall Boys". The front of the card features a large photo of Namath superimposed in front of a bright yellow background. The Jets' hometown city of New York graces the top of the card while his name and position round out the bottom of the card. The card has white borders which helps to reduce the risk of obvious wear and chipping that you will usually find on non-white borders. The reverse side of the card is split into two parts. The right side features a cartoon mentioning Namath's performance during the 1965 Orange Bowl as a member of the Alabama Crimson Tide. The left side contains a nice write-up about Namath joining the New York Jets and the high expectations that awaited him. A brief biography about him along with personal details round out the card back. Condition Issues: The card's tall design gave it a new and nice aesthetic appearance but also meant it was more exposed to potential wear and tear. So much surface area meant kids were much more likely to damage them. Centering is also a common challenge for the card. Estimated Worth: Namath's rookie card is high on the list of most expensive football cards and in PSA 8 condition they are typically selling for around $30,000 to $40,000. There are only four PSA 9 copies in existence and it's tough to estimate how much they'd go for in today's market but there's no doubt it would be above six figures. Namath's stats don't hold up anywhere near the game's greatest quarterbacks but he was an incredibly popular player nonetheless. He was most famous for guaranteeing the Jets Super Bowl victory over the Baltimore Colts in 1969 and making good on that upset call. He was also popular off the field having owned a popular New York nightclub called "Bachelors III" and even acted in movies and on television. The 1965 Topps football card set is iconic in the hobby and he's the key to the set. Condition challenges make higher grade copies much more hard to find. Joe Namath had an amazing career on and off the field and goes down in history as one of the game's most popular players of all-time. He was enshrined into the Pro Football Hall of Fame in 1985 and remains the winner of the one and only New York Jets Super Bowl championship. He was the first to pass for more than 4,000 yards in a season but overall his stats were relatively mediocre compared to today's lofty standards. Namath threw for 27,663 yards, posted 173 touchdowns and 220 interceptions while completing just 50.1% of his passes. Of course, the game is much different now and passing is much more prevalent. Not to mention that Namath battled injury most of his career. There's no question that Namath is a football icon and a beloved figure by Jets fans everywhere. Joe Namath rookie cards remain as popular as the man himself and are a must have for any serious football card collector!